An interesting week for the usd to cad currency pair, which closed on Friday with a narrow spread up bar, topped with a deep lower shadow as the market attempted to rally late in the trading session, only to be forced lower once again. This has been a recurring theme for the usd to cad pair, ever since the long decline form the dizzy heights of 1.3000 earlier in the year, with every attempt to rally lasting only a few days, before the market collapses under the bearish sentiment of the US dollar once again. Technically we are now at a critical point for the usd to cad pair, as should the 1.065 support level fail to provide any platform as seems likely, then we may well see a steep fall through the minor barrier below, and on towards parity where further support awaits. This of course assumes that we will see the US dollar continue to weaken this week, and with many analysts now suggesting that the dollar is over sold, a sharp correction may well be imminent, and could indeed be triggered this week with the FOMC rate decision and statement due for release on Wednesday in the US. The statement will of course provide the key as rates are likely to remain on hold at 0.25% for the foreseeable future. 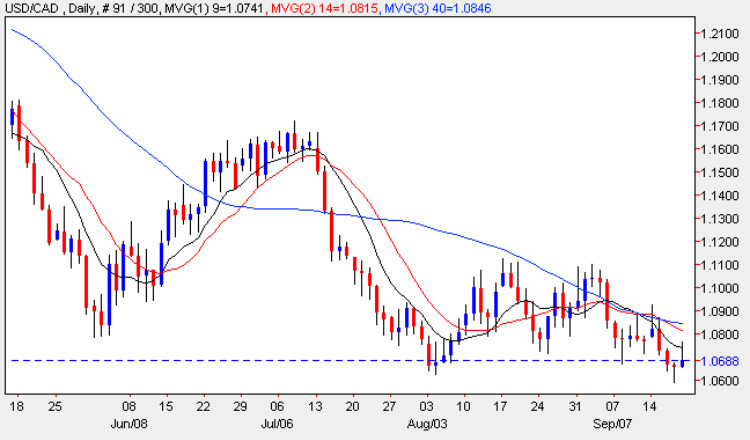 With all three moving averages pointing sharply lower, and with Friday’s high finding resistance at the 9 day moving average, there only seems to be one way to gor for the usd to cad in the short term! There is little in the way of fundamental news on the economic calendar on Monday, either in the US or in Canada, so we could see a quiet trading day for the usd to cad. The only item in the US is the CB Leading Index, and for Canada it is the Foreign Securities Purchases, which is the total value of domestic stocks, bonds, and money market assets purchased by foreigners during the reported month. The forecast is for 7.7B against a previous of 10.6B and the figures provide a view of the demand for domestic securities and currency which are directly linked since foreigners must buy the Canadian dollar to purchase Canadian securities.